I signed up for a game account before I decided to make my forum account, but I never got the activation email. I chose the same username and password for both, so my question is will happen to my account when everything starts working now that I have over 10 posts? Will they be linked, or will it just choose one or the other? Or will it just not matter altogether once everything starts working? What you should be doing is clicking on the 'forgot password' 1 - 2 times each day. 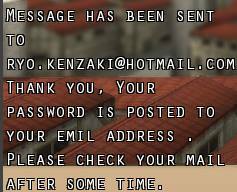 MFxEagle wrote: I signed up for a game account before I decided to make my forum account, but I never got the activation email. I chose the same username and password for both, so my question is will happen to my account when everything starts working now that I have over 10 posts? Will they be linked, or will it just choose one or the other? Or will it just not matter altogether once everything starts working? Ok I'll just ask this, will the forum and game accounts in the database be linked in any significant way (leaderboards/guilds/ranks/stats/etc. ), or do they just share name only? Because if the two are completely separate other than Feng wanting to reserve names for us, then I might as well keep try to get the in game one to work before Feng comes back to update it with the forum database names. MFxEagle wrote: Ok I'll just ask this, will the forum and game accounts in the database be linked in any significant way (leaderboards/guilds/ranks/stats/etc. ), or do they just share name only? Because if the two are completely separate other than Feng wanting to reserve names for us, then I might as well keep try to get the in game one to work before Feng comes back to update it with the forum database names. I have a question. If you do use Yahoo mail, will the email still arrive, albeit it's in Spam? Pendragon wrote: I have a question. If you do use Yahoo mail, will the email still arrive, albeit it's in Spam?